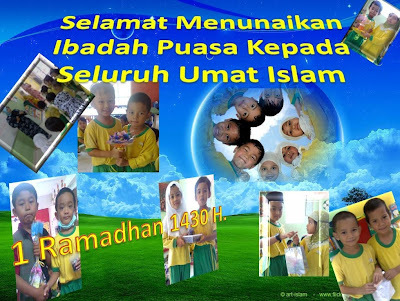 This is my school, the Children Islamic Centre in Kota Damansara! We have a huge playgroud outside where we play in the evening! Yes, I've actually started school since the beginning of August. Although I'm still in the period of adjusting, I have made some friends and get along very well with them, especially the older ones. My teachers and some of the kakaks adore me. I'm particularly close to 2 older girls whom I call kakak. They are sisters and their names are Misha and Melissa. Among my teachers, I'm attached to 'Teacher Fatima' although I don't mind 'Teacher Murni' taking care of me once in a while. The headteacher's name is 'Teacher Zana' (that's how we call the teachers there, 'Teacher', followed by their names) and she takes care of the older kids upstairs. She is the one Mommy pays the school fees to, monthly. It was difficult for Dadda and Mommy to leave me in the beginning but I'm really getting used to it now. I no longer scream my heart out everytime I see the teacher coming out to get me from the car! Anyway, the month of Ramadhan has just started about a week ago. We had a kenduri at school to welcome the month of Ramadhan where we had a guest who came over and talked a bit about fasting. Before we went home, everyone received a goodie bag each which contained chocolates and dates, yummy! I don't really understand what fasting means but so far, I think it's when Mommy, Dadda and my teachers don't eat and drink from morning until we hear the Azan for Maghrib prayers. Nobody refrained me from eating during those times so life to me goes on as normal. One day last week, Dadda received a call from 'Teacher Murni' informing him that I've taken a fall and have a big bump on my forehead. I did not cry but the looks on my teachers' faces told me that my bump was bad. They tried a lot of things to make it better including putting ice packs on the bump. Seeing that I was fine and didn't complain about the pain at all, they were relieved. Going home after a fun day @ school to break fast with Mommy & Dadda!